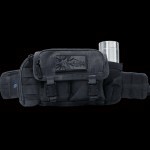 The Datsusara Joe Rogan Hemp Utility Belt is a nod to our friend Joe Rogan who loves his “fanny packs”. originally we made this just for fun but it’s very useful for cage side medics and other actives where you just need a bit more gear for your adventures. You can also attach the JRUB to any our bags which feature the MOLLE webbing, such as the BP, LBP, and CEB.